Phi Phi Natural Resort is unique as it has its own private shoreline with spectacular views of the tiny Bamboo and Mosquito islands in the turquoise Andaman Sea. This is a beautiful view that you can enjoy at your leisure in the Deluxe Cottage, which provides a huge outdoor terrace to sit and listen to the waves lap ashore. The cottage has a split-level design with a living room and bathroom downstairs and elegant bedroom on the upper floor. From the Deluxe Cottage, guests can easily stroll along the beachfront walkway to discover a swimming pool and a private sandy beach. 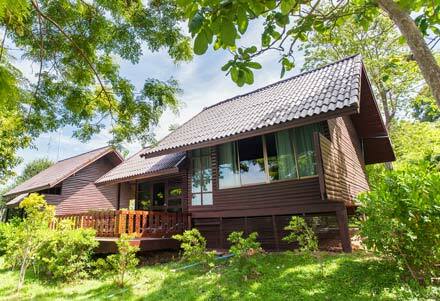 This is private and romantic, a great choice for Phi Phi Island honeymoons.